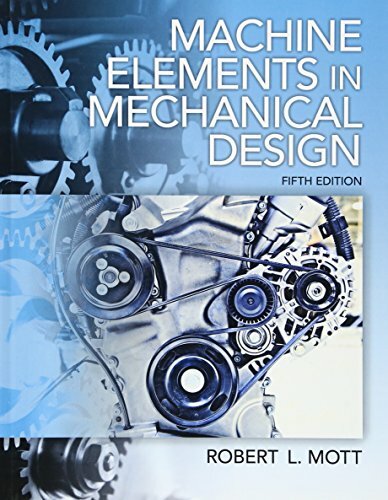 This fully updated text provides the concepts, procedures, data, and analysis techniques needed to design and integrate machine elements into mechanical devices and systems. Focused on practical, safe, and efficient design, MACHINE ELEMENTS IN MECHANICAL DESIGN, 5/e emphasizes proven approaches and the use of readily available materials. Readers learn an integrated approach that considers the entire system while designing each element. The first six chapters guide students through the transition to design and expand on their understanding of designing for different loads. Next, the text thoroughly covers machine elements involved in power transmission equipment, from drives to rolling contact bearings. Finally, it covers many additional machine elements, including springs, electric motors, clutches, brakes, linear motion devices, and fasteers, plus issues associated with structural design, connections, and welding. Wherever practical, design equations, data, and procedures are specified. Problems offer realistic practice opportunities; throughout, the authors demonstrate the use of spreadsheets and included software to simplify complex procedures. Updated web links and references promote further exploration.